John Cooper – ‘cut his teeth’ as one of the Northern Territory’s leading fishing guides and winner of the NT Barra Classic. 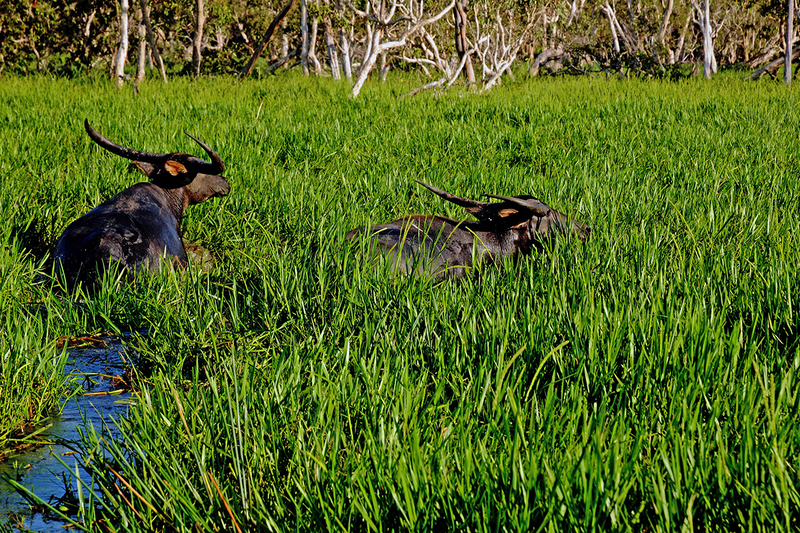 He joined Wild Bush Luxury in 2012 to manage Kuri Bay in the Kimberley before taking on Bamurru in 2013. 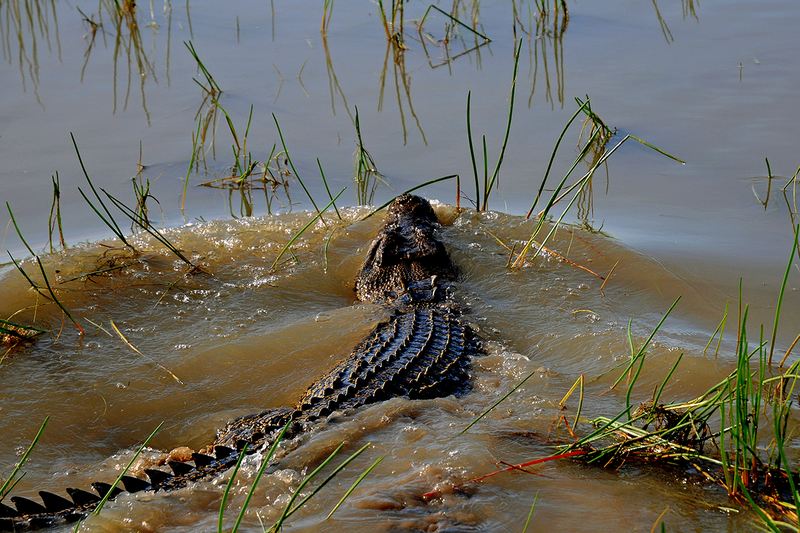 John is a champion fisherman and chief wildlife warrior with an inbuilt crocodile locator ! Boutique Wildlife Safari Lodge. Luxury Lodges of Australia. 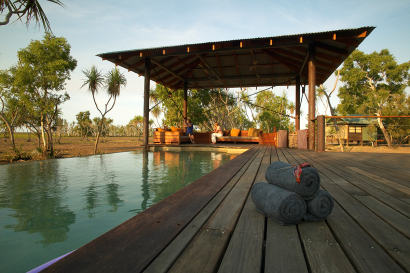 Bamurru Plains is a ten room safari lodge located on a 300 km² private property just to the west of Kakadu National Park on the Mary River floodplains and offers the opportunity to experience a spectacular landscape with just a privileged few other guests. 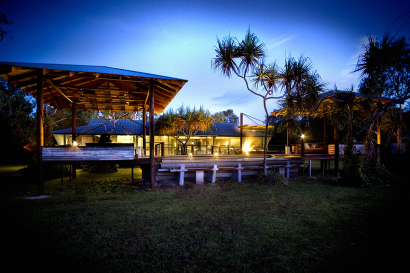 The lodge opened with just three rooms in 2006, was awarded Conde Nast’s Reader Awards ‘Best Hotel in Australasia’ in 2008 and was a founding member of Luxury Lodges of Australia in 2010. 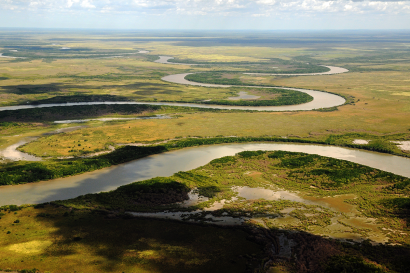 The Mary River floodplains are Australia’s answer to the Okavango and harbour an extraordinary diversity and volume of wildlife and birdlife. 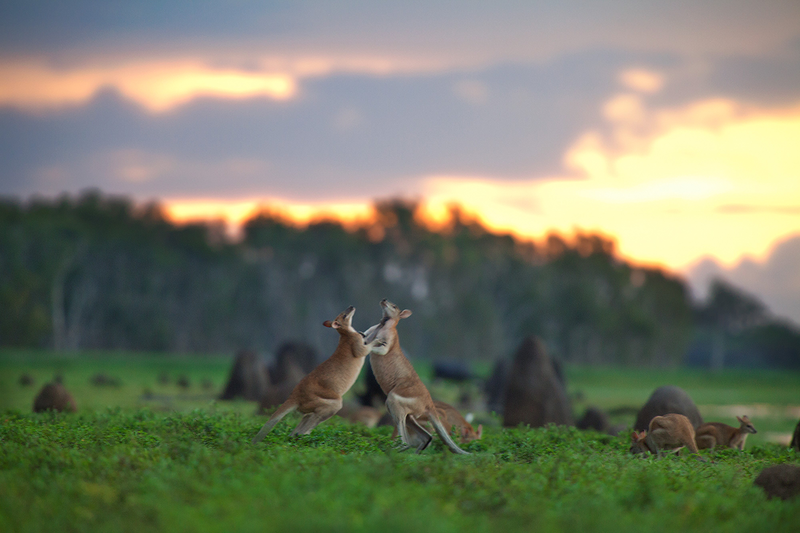 Bamurru’s ‘Wild Bush Luxury’ formula is focussed on opening up some of Australia’s most inspirational landscapes in the company of hosts and guides who have a real knowledge and passion for Australia’s natural and cultural heritage. Six rooms were added in 2008 and the Kingfisher Suite (the 10th room) was opened in 2015. ‘The Hide’ was opened in 2015 to offer guests a romantic treetop hideaway overlooking the floodplain. The real luxury is in the fact that Bamurru has exclusive access to 300km² of wetland and savannah woodland for a maximum of just 20 guests and avoids the more mainstream tourism of neighbouring Kakadu National Park. Bamurru is located on a private property 100km to the east of Darwin and just 10km west of Kakadu National Park. On the edge of the Timor and Arafura Seas and closer to the islands of Indonesia than most of Australia, the ‘Top End’ is a region of climatic extremes and an annual cycle of environmental rebirth. This fragile ecosystem remains one of the world’s most beautiful wilderness areas with a vast diversity of animals and birds. 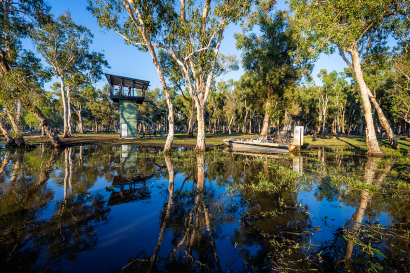 Just three hours’ drive or 30 minute scenic flight from Darwin or Kakadu flying over some of the most spectacular wetlands in the world. 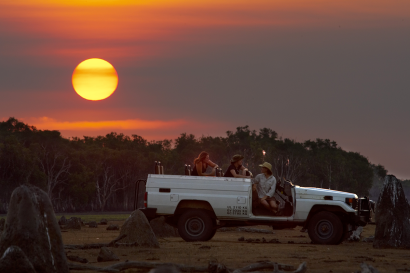 Activities focus on exploring the surrounding country away from the lodge, with airboat trips on the wetlands, river cruises in search of crocodiles, bird watching, astronomy evenings, bush drives, quad bike safaris and guided walks, while ancient rock art and indigenous culture are an easy optional day trip out into Kakadu or Arnhem Land. In the early part of the year (February to April), Bamurru is a dedicated fishing lodge with exclusive access to 130 km² of floodplain and a private barramundi fishery. With Bamurru’s emphasis on exposing guests to the environment, the design of the safari bungalows allows you to watch the parade of wildlife emerge to feed on the floodplain from the comfort of your bed. Let the wildlife come to you ! ‘The Hide’ provides a new way to experience the beauty of Bamurru Plains with the option of a private picnic lunch from six metres high in the treetops. We believe that connecting children to the bush is fundamental to their education and families with children from six years are welcome. Away from the distractions of television, computers and urban life, a stay at Bamurru is an opportunity to inspire children with stories from the bush – spot the local wildlife from open top safari vehicles, learn about life on the floodplain with rides on Bamurru’s airboats, spot crocodiles on a river cruise, learn to crack a stock whip ! For the parents, there is still the prospect of three course dinners prepared by our resident chef served with premium wines around the camp table. 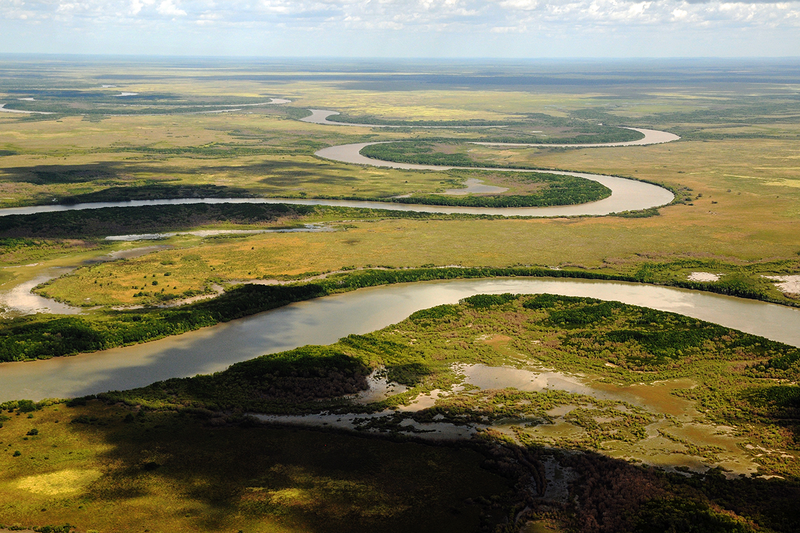 Built amongst the fringing woodland on the edge of the Mary River floodplain, Bamurru Plains is ideally located to discover the abundant wildlife of this extraordinary region. 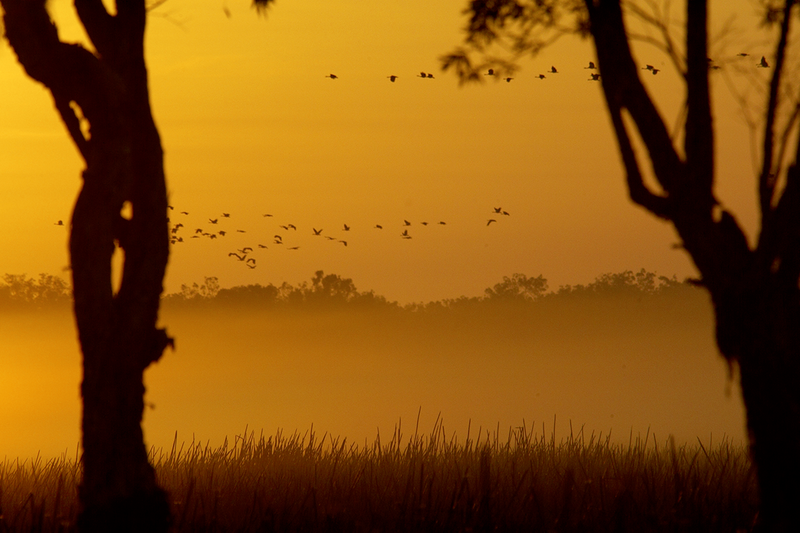 The Mary River catchment is home to some 236 species of bird, many of which are found at Bamurru Plains where the birdlife congregates in extraordinary numbers rarely seen elsewhere in Australia. The day breaks to the tune of thousands of Magpie Geese, the whistling of the kites and the thumping of Agile Wallabies hopping by your bungalow. All ten rooms are designed to showcase the environment and the focus is therefore outside. 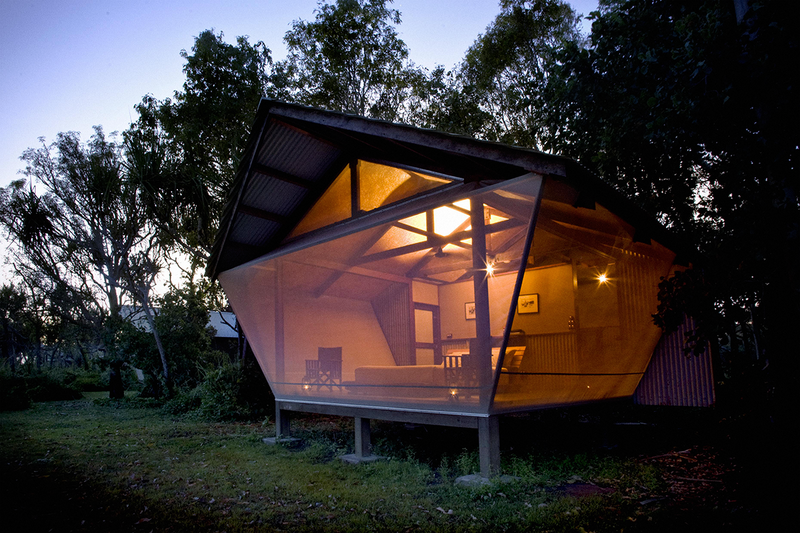 Rooms have fine mesh screen from ceiling to floor on 3 sides, offering 180⁰ views of the bush and floodplain. The décor reflects the region’s earlier indigenous, hunting and pastoral history, with buffalo horns, explorer’s maps, Aboriginal art work and fish traps providing guests with a sense of the human heritage of the area. The focus is on a supremely comfortable bed (organic cotton linen, pillow menu), spacious ensuite bathroom with high pressure showers. Each room has a cold water thermos, local flora and fauna reading materials, species lists and binoculars. There is no internet access, television or mobile phone coverage, leaving the focus of a stay on an immersion in the stories of the bush. The Kingfisher Suite offers more space, a lounge area and the capability for in-room dining and is perfect for either honeymooners wanting some privacy from the more participative nature of the main lodge or for families who would prefer to dine with their children separately. The bathroom features twin basins and showers, within a décor of rustic chic timber and corrugated walls utterly in tune with the environment. For maximum exposure (and only the local Agile Wallabies as company) the suite also offers a shower with full ceiling to floor views across the floodplain and surrounding paperbark forests. Three bungalows can be air conditioned, however as power is mostly solar generated, this requires additional generator capacity and there is a surcharge of $120 per night for this. Air conditioning must be requested at time of booking. Our philosophy to provoke, inspire and reconnect guests to the bush is reflected in every aspect of a stay at Bamurru Plains, including the all inclusive dining experience. Incorporating native and locally sourced produce to provide a gourmet experience integrating authentic, yet contemporary Australian recipes, from kangarooo skewers to crispy barramundi with finger lime salsa and Quandong ice-cream. Start the day with a hot breakfast and lunch is usually served on the wildlife observation deck overlooking the floodplains. Canapés out in the wilderness while out on afternoon activity are followed by a three-course dinner hosted by a safari guide. Guests can watch our chef create superb dishes in the open kitchen from the dinner table. A self-service bar with a selection of beverages is included and available to guests throughout their stay. The wet edge pool and deck is a great spot to sit back with a drink and let the wildlife come to you. A library with a broad range of Australian nature and cultural reference books in available in the lodge. 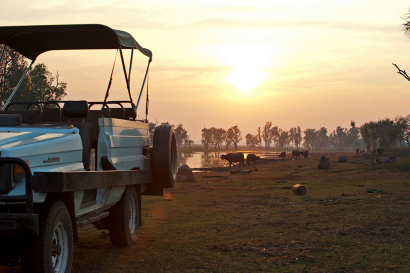 • Bamurru Plains is small enough to book exclusive events and run the wilderness safaris at your own pace with all the personalised touches to suit. 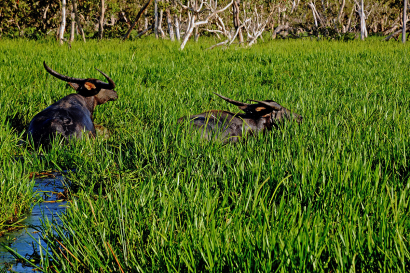 • Fishing competitions (in season), game drives in open 4×4 vehicles, navigating Bamurru’s floodplains by airboats and cooking challenges are all possible. 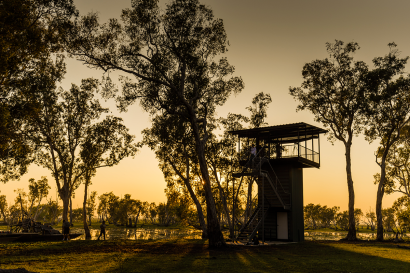 Whether you’re a twitcher at heart or just looking for a quiet and unique escape during your stay in Australia’s Top End, Bamurru’s new luxury bird hide provides the perfect retreat. Raised six metres above the Mary River floodplains, ‘The Hide’ offers the perfect spot to perch, and take in this vibrant area and variety of local wildlife. There’s plenty of privacy for an intimate Siesta lunch Retreat or sleep out in the treetops for an unforgettable evening under the starry night sky. Excellence in Building & Construction Awards 2009 – Excellence in Building for NT Climate.